Oh what a night! This past Friday we had the experience to watch the Tony-award winning show 'Jersey Boys' at the Fox Theatre. JERSEY BOYS is the story of Frankie Valli and The Four Seasons: Frankie Valli, Bob Gaudio, Tommy DeVito and Nick Massi. This is the story of how a group of blue-collar boys from the wrong side of the tracks became one of the biggest American pop music sensations of all time. They wrote their own songs, invented their own sounds and sold 175 million records worldwide - all before they were thirty. 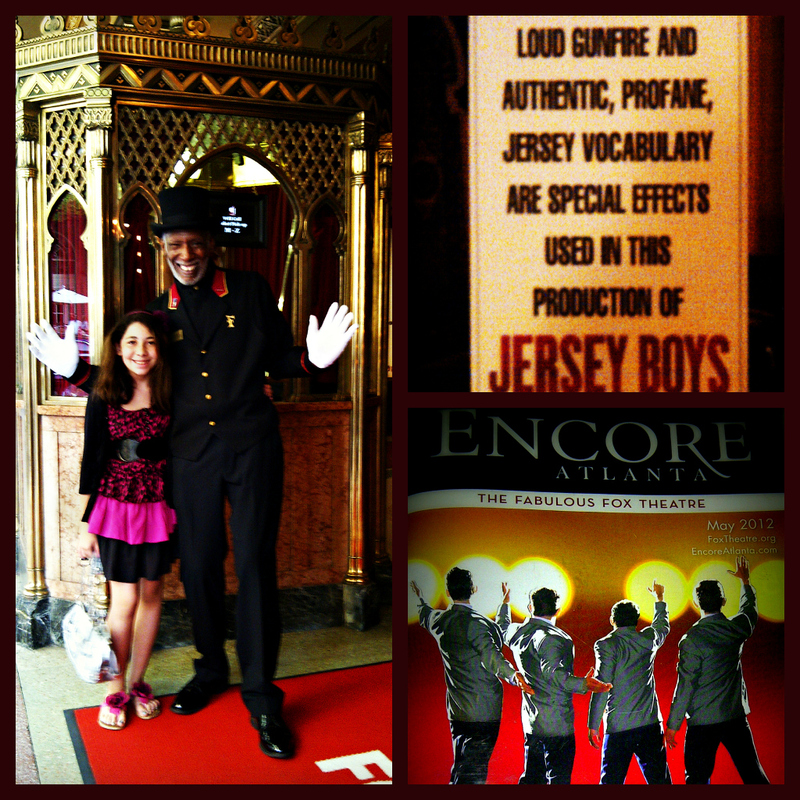 Jersey Boys is a full-fledged, well-produced, amazing Broadway experience. The show is straight forward biography and is a must see even if you are not into Broadway musicals. The songs are played exactly as they sound in the original soundtracks. The audience goes wild, and as much as you try to hold it you always end up singing and dancing with the crowd. I swear. I'm still humming the songs in my head.... The show has a lot of profanity, but is nothing "scandalous" or extremely offensive. Is just the typical "jersey" language. I took my 11 y/o and she LOVED the show. Overall, Jersey Boys is one of the top 15 must see Broadway musicals of all times. Tickets for JERSEY BOYS begin at $28 and are available through authorized ticket sellers at the Fox Theatre Box Office, Ticketmaster outlets, online at www.broadwayinatlanta.com or by phone at 1-800-982-2787. Orders for groups of 10 or more may be placed by calling 404-881-2000. Performance schedule, prices and cast are subject to chance without notice. For more information, visit www.JerseyBoysTour.com or www.broadwayinatlanta.com. I truly love that show. I grew up with my dad going on and on about how good Frankie was and I'm so glad he did. I too have searched endlessly for a biography of sorts for them, but never found anything worthwhile. As for Jersey Boys, I have seen it in San Francisco while tickets were cheap.. and London and both were amazing nights. That's awesome! Good to know!